M&C Saatchi, Tricky Jigsaw and Fin Design create storybook and VR app for Commonwealth Bank targeting children. Commonwealth Bank has released a storybook and accompanying virtual reality (VR) app for promoting financial literacy for children. The app and Sammy the Space Koala book aim to teach children financial lessons through immersive storytelling. The story follows Sammy the koala, who travels through the galaxy in search of a magical present for her Grandma’s birthday. Throughout the journey, kids are invited to participate in VR chapters, learning lessons about ‘needs’ and ‘wants’. The experience, driven by M&C Saatchi Sydney is an expansion of CommBank’s Start Smart program for kids. M&C Saatchi worked with Tricky Jigsaw to design the product experience and Fin Design to illustrate the storybook and translate those assets into VR material. Sammy the Space Koala book, written by Ursula Dubosarsky comes with a cardboard headset. 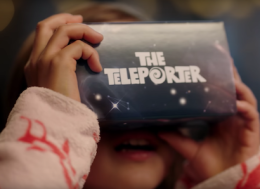 “‘The Teleporter Adventures’ are a hybrid of the classic storybook and virtual reality worlds. As a new platform for immersive storytelling, we hope to reach more and more kids and communities around Australia with a fun way to learn about money,” says Michael Canning, executing creative director at M&C Saatchi Sydney. ‘The Teleporter Adventures will be publicised in CommBank’s owned channels, social and with a 30 second launch film animated by Heckler TV and produced by M&C Saatchi. According to Commbank, about 10% of Australian children under 15 lack even basic financial literacy. Start Smart is part of the Commonwealth Bank’s corporate responsibility project – and aim to engage consumers early – Opportunity Initiatives. This article was originally published on Marketing.